Nuovissimo appartamento! Ristrutturato e arredato nel luglio 2018! Posizione perfetta per esplorare la città imperiale di Vienna in inverno e in estate. Spazioso appartamento elegantemente arredato, con spazio sufficiente per un massimo di 8 persone. Cucina molto ben attrezzata, 3 TV LCD, ampio bagno con doccia e vasca, cabina armadio. L'appartamento si trova a 15 minuti dal centro di Vienna. L'appartamento è situato in un'antica casa di città vecchia viennese. L'appartamento di 100m2 offre una cucina con lavastoviglie, Nespresso, un grande frigorifero e una zona pranzo per un massimo di 8 persone. L'ampio e luminoso soggiorno ha un grande divano, una grande TV LCD (via cavo e Smart). La connessione Wi-Fi è ovviamente. Le due camere da letto hanno un grande letto matrimoniale e un letto singolo / giorno. Entrambe le camere hanno anche una smart TV via cavo. Il lussuoso bagno è dotato di vasca, cabina doccia e doppio lavabo. Asciugamani e biancheria da letto ovviamente inclusi. L'appartamento ha anche un WC separato e un ripostiglio con lavatrice. L'appartamento è arredato secondo standard elevati e dotato di pezzi d'antiquariato selezionati. Se necessario, sono disponibili attrezzature per neonati e bambini sufficienti. L'ampio bagno ha una cabina doccia, un bagno e un doppio lavabo. La finestra nel cortile verde offre molta luce naturale. A beautiful, well-equipped, comfortable and spotlessly clean apartment for 2 couples or a family. We felt very comfortable and welcomed in Monica's apartment. She gave us helpful information about being in Vienna over the Christmas holidays, and she put up a lovely Christmas tree that we enjoyed. The apartment is spacious and well-equipped. The rooms have been modernized but it still has the feel and charm of a flat from an earlier era. Every room is large, and it is nicely decorated. It is very quiet--at least in winter with the windows closed which was nice for sleeping. We cooked part of the time and the kitchen was equipped alright for simple cooking. The neighborhood has plenty of good amenities and a personality of its own, distinct from the main tourist areas. It is an easy train ride or Uber ride to the inner ring of the city. All in all, we were very comfortable and appreciated the thoughtful touches that Monica provided in the apartment. Vienna is beautiful and this was a great place to stay and enjoy it. Wir haben den Aufenthalt in Wien in Frau Stadlers schöner Wohnung sehr genossen. Die neu renovierte Altbauwohnung Wohnung ist sehr großzügig geschnitten, geschmackvoll eingerichtet und blitzsauber. Die Währingerstr. mit vielen guten Restaurants, die Volksoper und die U-Bahn sind in 5 Min. zu Fuß zu erreichen. Frau Stadler ist eine besonders nette Gastgeberin. Sie empfing uns schon unten vor der Haustür, erklärte uns alles genau und gab uns eine lange Liste mit allen guten Cafés und Restaurants in der Nähe. Eine Sachertorte und ein Prosecco standen auch schon für uns bereit. Falls ich wieder nach Wien komme, würde ich diese Wohnung wieder mieten. Very nice and well equipped flat. We ( 3 adults and two teen-agers) really enjoyed our stay in this flat. A lot and very convenient connections to downtow ( 10 minutes away). Tastefully furnished and decorated flat. The owner was very available and concerned about our wellbeing. Monica is a charming hostess, who met us at the apartment even though we were very late. The flat is on the second floor, approached by a wonderful old staircase, the hall ways are being renovated, but its very atmospheric. The flat is large, light and airy, everything in very good condition, because it's newly converted. The kitchen is simple but equipped well enough for a group of 4. 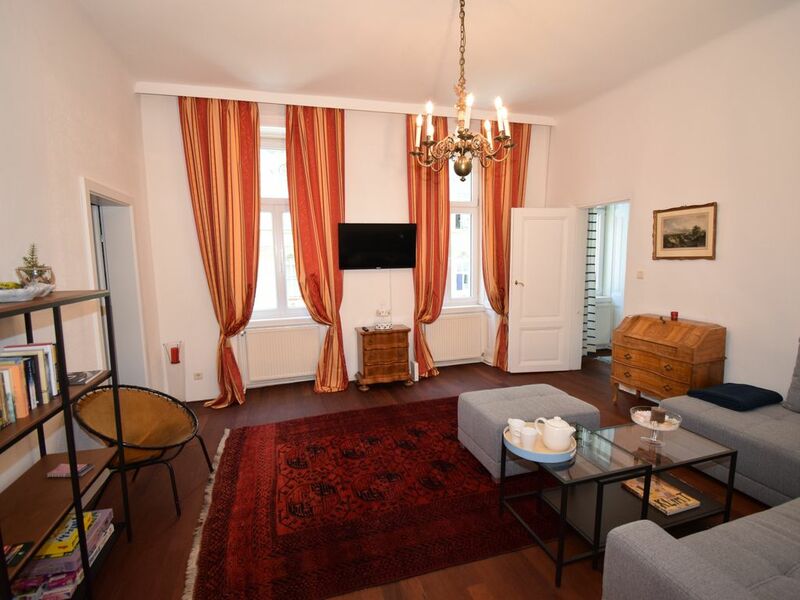 The apartment is in a great location, about 400m from the metro, (about 15 mins into Swedenplatz and 20mins from the vineyards), a local bakery is on the corner and there are numerous nice restaurants in the area. I would definitely return here, when I come to Vienna again.